#inktober #inktober2014 #sketchbookpro #artweaver #pensketch - Day 18 sees some Billy Hopson action, aka - Jumping Boy! Got done doin all I could do on some extra work tonight. And started falling asleep at my desk. Then saw it was already 10/18 and decided to do some after-midnight sketching! Used the pen in the trial version of AutoDesk Sketchbook Pro and did the sketches - then took it over to Artweaver trial version I have and did up the colors. Very impressed with how Artweaver is almost a direct alternative to photoshop in setup and commands/ useability. Only thing missing is a pen tool and I'd pretty much buy the full version and switch. Fraction of the cost, all the functionality. More than capable to do what I need. But not quite there. Fun to tool in for fun though. 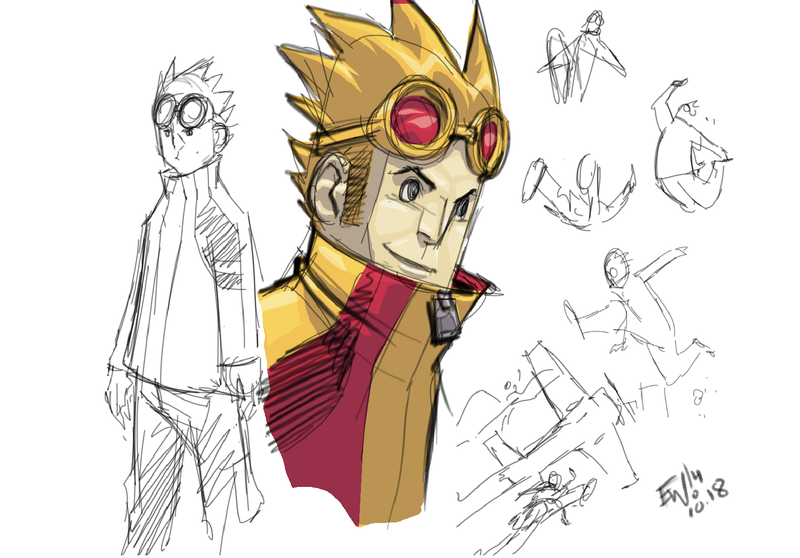 Sketchbook pro with the trial's limited pencil/ and ballpoint pen tools is still a blast to sketch in. I absolutely love the one button ability to rotate/ zoom in and out and move canvas up and down with just a simple press of ctrl and moving the stylus. Absolutely LOVE that. If there was ONE feature i could carry over and plug into my photoshop or inkscape. It would be that. That alone is tempting me to buy the whole thing. Again, only thing stopping me is the vailability of a vector/ bezier pen tool. The moment i find an alternative and pro-level software that has that i am ditching photoshop. Till then, Photoshop will be my ol' ball and chain. Itching to do up some more Jumping Boy - will be back from Hiatus sooner than later for sure! October Micro Sale 2014 is Complete!